ELA’s 23rd Annual Conference in March brought together three highly knowledgeable experts for a question and answer panel session on Native Grass and Wildflower Seeding: Mark Fiely, Horticulturalist at Ernst Conservation Seeds, Carlos Montoya, owner of Native Plant Associates on Martha’s Vineyard, and Larry Weaner of Larry Weaner Landscape Associates. Moderated by George Batchelor, Landscape Supervisor for MA Department of Transportation’s Highway Division, Mark, Carlos and Larry shared their years of experience and expertise. 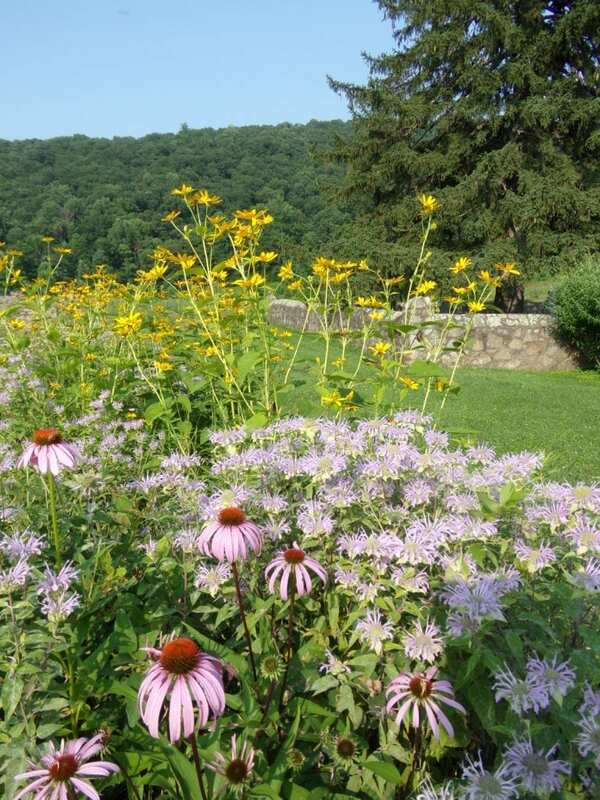 Echinacea purpurea (purple coneflower), Heliopsis helianthoides (Ox-eye sunflower), and Monarda fistulosa (wild bergamot) provide diversity in a summer meadow. Mark Fiely, Ernst Conservation Seeds. The speakers kicked off the session with short introductions prior to taking questions from the audience. Mark, who has extensive knowledge of the supply side of the industry, noted that seeding allows for a greater diversity of species, and consequently, provides habitat for a wide variety of fauna. While we may consider some of the insects that depend on these species to be undesirable, such as yellow jackets and wasps, they all play an important role. Wasps, for instance, are vital as natural controls for insect pests in our crops and gardens. Along with creating habitat, using a diversity of grasses and wildflowers results in a more visually vibrant and interesting landscape. Carlos Montoya, who specializes in restoring and expanding the native coastal meadows of the Sand Plain Grasslands, touched on how this plant community is very specific and limited to those species that have adapted to well-drained, nutrient poor soils and coastal conditions. 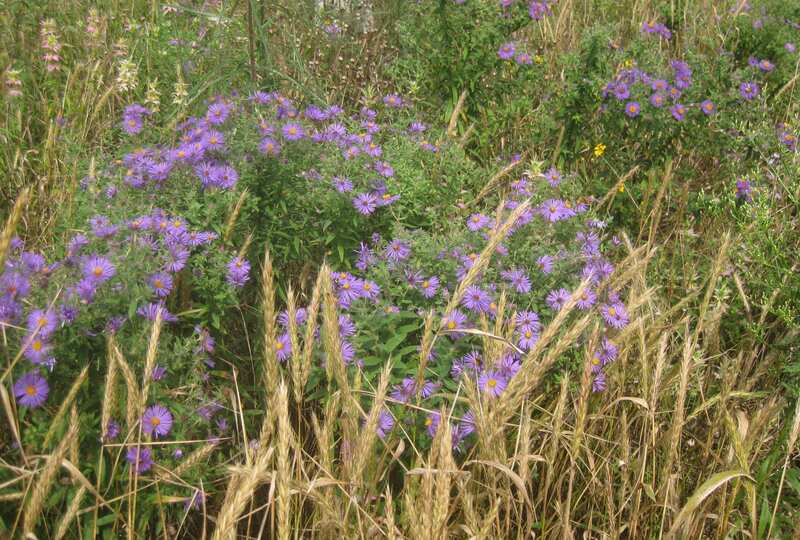 Typical of this plant community is little bluestem, a variety of associated wildflowers, and low shrubs such as blueberry and bearberry. Due to the limited palette of species in the Sand Plain Grassland plant community, Carlos’ designs focus on replicating natural patterns. Penstemon digitalis (tall white beardtongue) offers late spring color. Mark Fiely, Ernst Conservation Seeds. Larry Weaner, who has a national reputation for combining ecological restoration with the traditions of garden design, emphasized that, unlike with traditional approaches to creating a landscape, it’s important to understand that seeded meadows develop and express themselves over time. Different species establish and bloom over different periods of time. For instance, species such as Rudbeckia (black-eyed Susan) may bloom within the first year or two, while others, such as Baptisia alba (white wild indigo), may take six years or longer to establish and bloom. 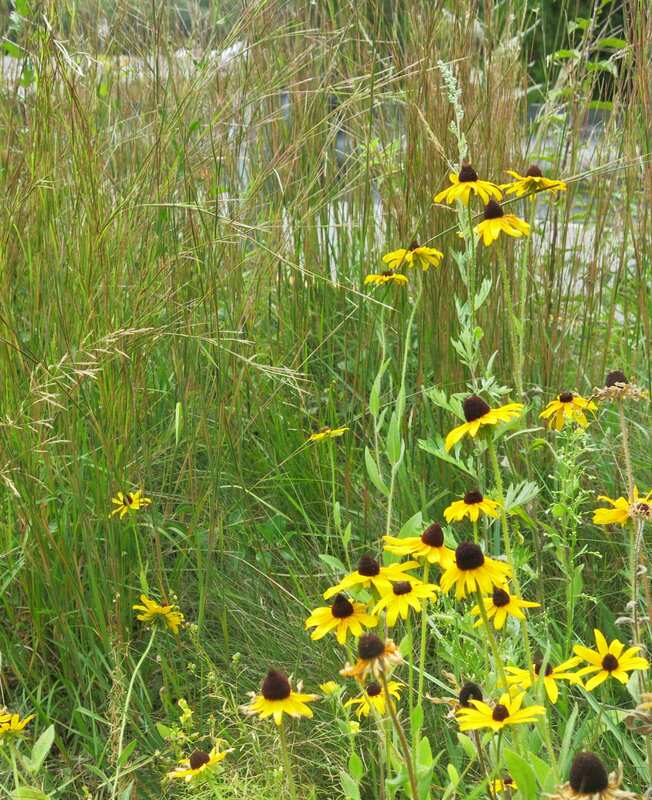 Understanding the complexities of plant growth, establishment, and longevity is essential when designing a meadow and in knowing how to manage client expectations. For those who were closed out of the session or who couldn’t attend this year’s conference, the following summarizes a selection of the questions posed and answers provided. 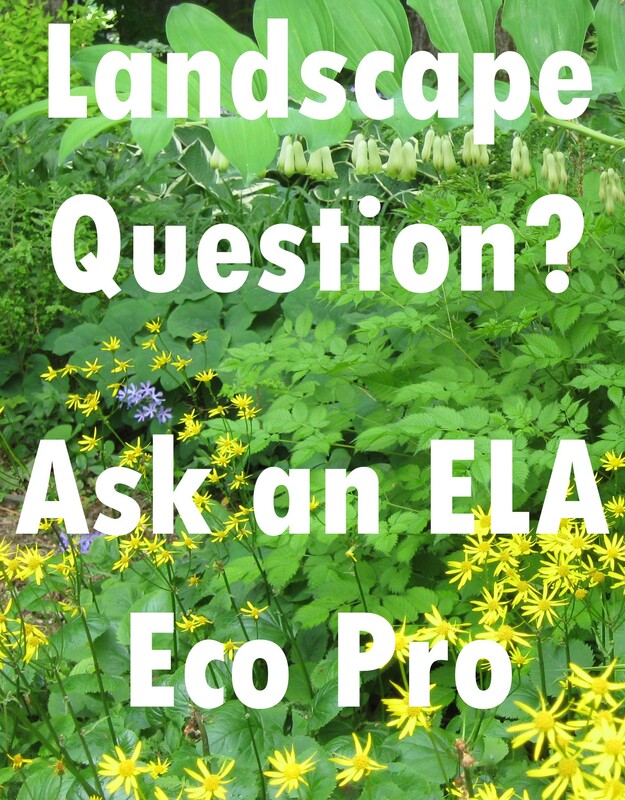 Q: Warm season perennials and grasses don’t take off until the warm season hits, which is often not until the end of June. Are there any recommendations for early blooming species? Penstemon hirsutus (hairy beardtongue) blooms in May, Zizea aurea (golden alexanders) blooms at the end of April, and Sisyrinchium sp. (blue-eyed grass) blooms May to June. Though not native meadow species, daffodils provide color if there is a need to meet ornamental expectations. And there is no scientific evidence that non-native daffodils would have deleterious effects. Black-eyed Susan (Rudbeckia hirta) establishes more quickly than most other perennials. Q: Is there any information on the development of meadow plants from seed to full flower to help designers address the transition of plants over time? There is no textbook answer. Meadow ecology is complex. Species such as Liatris (blazing star) typically take five years to establish. Yet, there are instances when they show up in the first few years. While there are many variations, species generally follow the same pattern. For instance, Liatris is always slower to establish than Rudbeckia (black-eyed Susan). Plants that have minimal root systems, usually shorter-lived plants, will establish more quickly than those with deep roots such as Baptisia alba (white wild indigo). 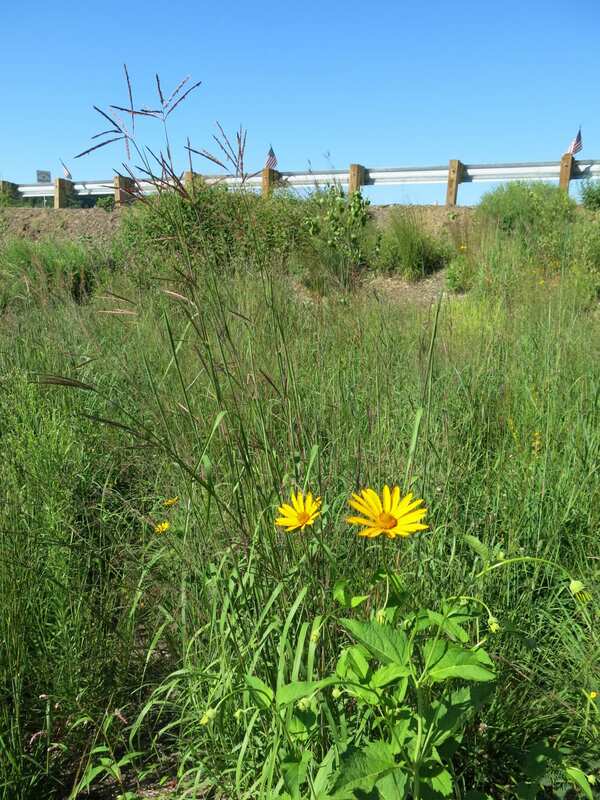 Q: There is often pressure from clients to add non-natives to plant communities and regulatory pressure to allow meadows to convert to woodland; however, it is often easier to control invasive plants by maintaining the land as grassland. 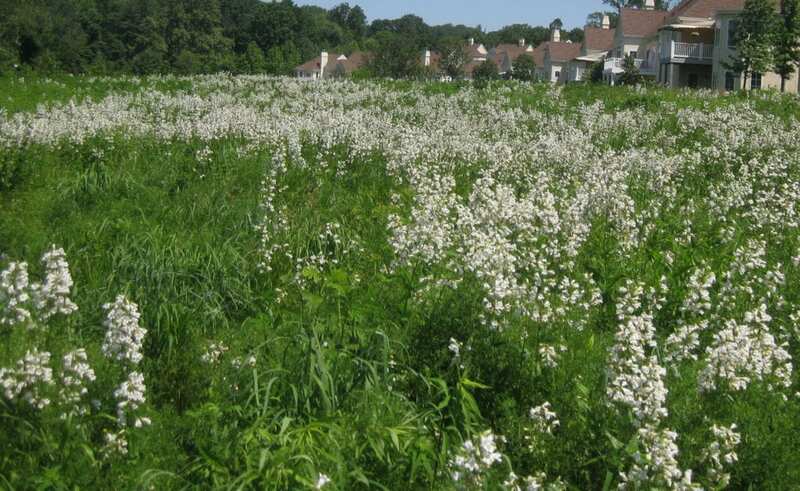 Can the panelists comment on use of non-native plants for meadows and on managing invasive plants? Incorporating non-natives is not necessarily bad. Feather reed Grass ‘Karl Foerster’ (Calamagrostis x acutiflora ‘Karl Foerster’) is a non-native grass, but it’s a sterile grass, so it can be added to meet the expectation of a certain designed look. Invasive weeds are one of the biggest difficulties. Woody species such as multiflora rose are manageable as they can be targeted with spot spraying. However, a solid cover of weeds such as plantain or dandelions can be more problematic as they prevent establishment of desirable species. If you can see the soil and your seedlings are coming up, the seeding is okay. You only need to hold back the weeds until the desirable species are established and will then be competitive. That first year is very important and you need to stay on top of the weeds and treat them immediately by scalp mowing or spot spraying patches. In the second year after seeding, native bunch grasses such as little bluestem, deer tongue, Canada wild rye, and big bluestem begin to put on more above ground growth. 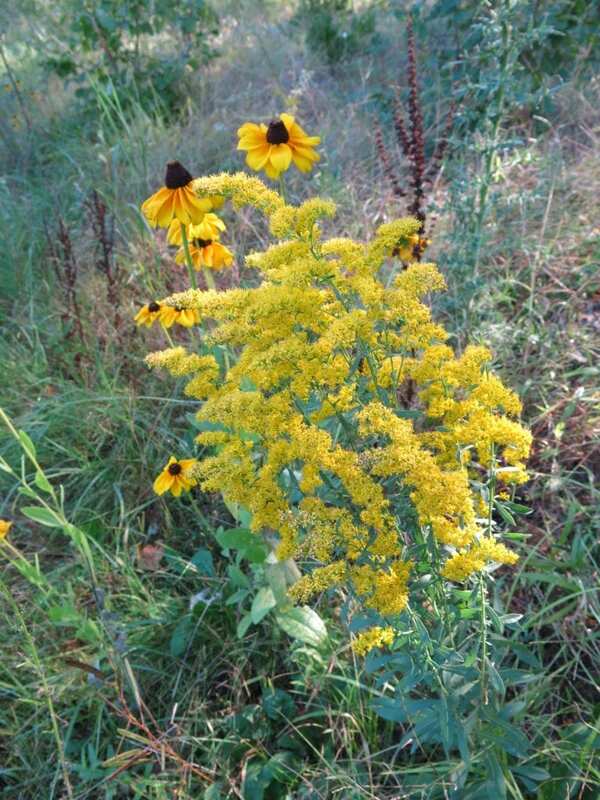 MassDOT native seeding, Leominster, MA. Q: What are your recommendations for site prep? 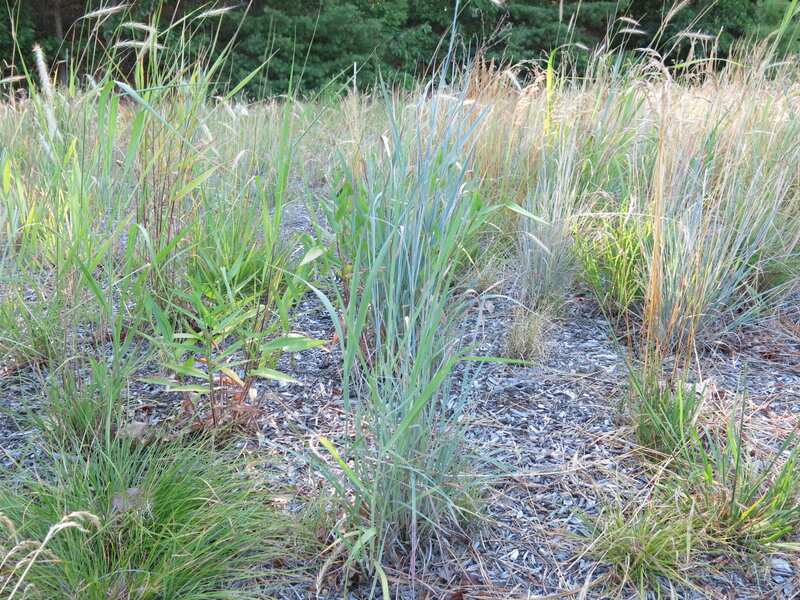 Little bluestem likes sandy soil, so sand is important. You need to clear the area of weeds, either with herbicides or repeated tilling and then you may need to add lots of sand. You also want to have plants covering the soil to keep weeds out. You can use cool season species adapted to sandy environment, such as sheep fescue or Deschampsia (tufted hair grass), to get that soil coverage. Nut grass and crabgrass are annuals that can be problematic until you get past that first year. Pre-emergents that are tolerated by little bluestem can be used, but then you need to follow up and seed where the ground was treated. Planning on treatment with over-seeding of patches or adding plugs in the second year is one strategy. However, use of plugs with seeding is risky and makes management more difficult for mowing or herbicide use. Postponing plug planting until the second year is recommended. Warm season grasses are clump species, so plugs can be used to fill in gaps. Dormant seeding in fall or spring with mowing every 4-6 weeks for weed control is generally recommended. Ensuring that the seedlings have access to light is most important. There is no one rule for every situation. Site preparation depends on soils. Sandy soils do not get dense weed cover, so sandy, infertile soils are easy for establishing native grasses. There are many factors, so there is no rule book. The important thing is to get bare ground. The easiest way is to use herbicides. However, if you don’t want to or can’t use herbicides, the Rodale model used for agriculture is an excellent source for information. Typically, they use smothering or repeated tilling to weaken the pool of seeds. Big bluestem, black-eyed Susan, showy tick trefoil, goldenrod, and partridge pea three years after seeding. MassDOT I-95 restoration seeding, Waltham, MA. 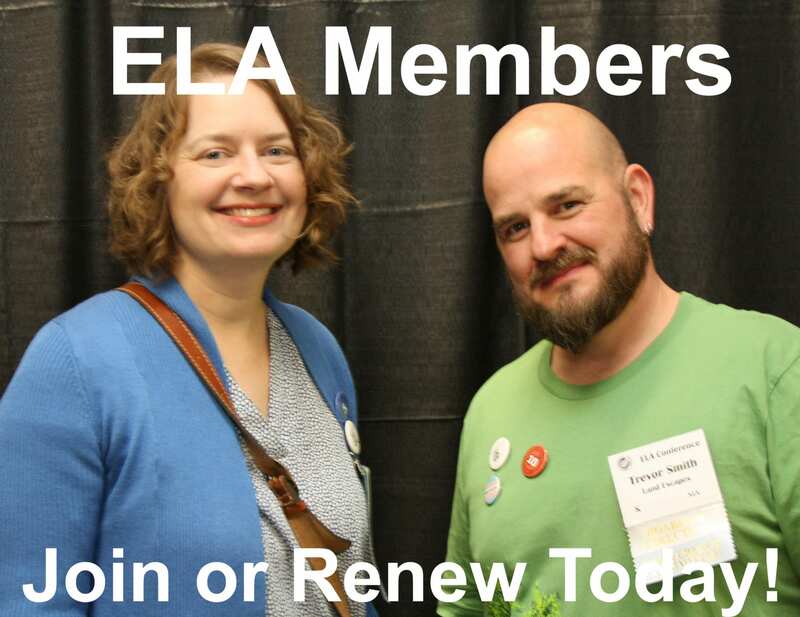 Q: Why isn’t there a local or regional ecotype seed? Suppliers need to meet market demands and balance the cost of producing seeds. Starting up seed production requires a huge source of knowledge, and it can be prohibitively expensive to produce seed. Seed needs to be collected at specific times and this can be a very short time period before you lose the seed. Seeds need to be cleaned and sorted, so you need the machinery for that, and you need space for the machinery. You need to keep records of everything, so you need that infrastructure. It’s more cost effective for local sources if they can feed into larger established companies such as Ernst. But Ernst also has to check the actual seed to verify that it is what the grower says it is. Different ecotypes also differ in cost to produce. A Florida ecotype may be cheaper than a Pennsylvania ecotype – so PennDOT or other Pennsylvania buyers may select the Florida ecotype to save money. As with all goods, the market drives product selection. A UConn study found that to develop local ecotype supply it would take about a half a million dollars to get started, and you would need a diverse set of crops to make sure that you have enough product to account for different seed production numbers. 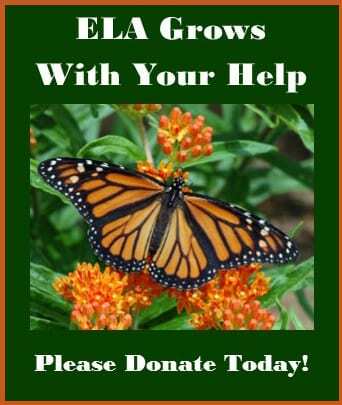 For instance, the yield of swamp milkweed seed could be as high as 300 pounds per acre in one field, but as low as 1 pound per acre in other fields. This volatility in yield contributes to keeping prices higher because we don’t know why yield was good in one field and not another. Solidago nemoralis (gray goldenrod) and Rudbeckia hirta (black-eyed Susan) in second year after seeding. Add to all this, flowering crops need to be managed, so you have thousands of acres of flowers that need to be managed for weed control. With more herbicide resistant weeds, the problem is even greater. Seed has to be tested for purity, which costs about $50. If, for instance, Palmer amaranth (Amaranthus palmeri) is found in the mix, it can’t be sold. The seed has to be further tested for an additional $200 to find out if the amaranth has a specific DNA. All of these complications and factors result in increased costs. [Author’s Note—Native to the southwestern desert of the US, Palmer amaranth is an aggressive weed in agricultural crops and has been classified as a prohibited noxious weed in Ohio and Minnesota. It has been found to be resistant to glyphosate and other herbicides. DNA testing is used to determine whether seed is Amaranthus palmeri or another Ameranthus species]. Q: For seeding in vacant city lots where herbicides can’t be used and we don’t have the means to till and have little money, how can we reduce the existing seed bank in the soil? Smothering with black plastic is effective in eliminating weeds for small areas, but it will not kill seeds. After using black plastic, don’t seed immediately. Rake the seedlings and repeat this for a few months until the weed bank is exhausted. Rake while seedlings are small enough to be taken up by raking. Put down compost and then seed directly over the compost. If compost is good quality – weed free – it allows the desirable species to establish. You can also use clear plastic to increase the heat to 130 degrees F. This temperature will kill seeds as well as act as a fungicide for fusarium wilt. As the plastic will also kill other organism, using compost will help restore them. Q: There is a high level of anxiety when seeding meadows because we don’t know what to expect. How can we tell what’s happening, whether the seeding is successful or not, and how do we convey this to our clients? With warm season species, nothing is likely to germinate until June, so you can’t expect to see anything early in the season. As establishment can be slow, identification is difficult. Using photos will help with identification. Showing clients photos of year 1, 2 and so on is also helpful so that they know what to expect and what to look for. Coreopsis and big bluestem grass. MassDOT roadside restoration, Brookfield, MA. Once seed comes up, look for those species that are dependable as indicator species, such as wild bergamot, penstemon, black-eyed Susan, and coreopsis. If they are there, your seeding is likely fine. Species like blazing star or Baptisia take a long time and are sparse in a mix, so it is not unexpected that you won’t see them. As long as you see your indicator species coming up and the areas are not overcome with weeds, the seeding is okay. People react to what they see at the moment; emphasize what will be. Use photos and describe in graphic terms how the meadow will fill in. Set expectations by separating the maintenance into early stage and late stage phases. Refer to that entire first year as “Installation.” Seeding is then just the first step in the installation process. Plants are “installed” that second year when they are visible and putting down roots. This may help manage expectations. Being clear with the expectations up front is important. For instance, with native seeding in the Sand Plain Grasslands along the coast, that first growing season is short. Warm season plants don’t start growing until June – and then the season is over by August. Again, pictures help with managing expectations. Q: Recommendations for converting fertile soils to meadow? Plants grow differently in different soils. Virginia wild rye is great because it establishes fast. However, in fertile soil, it grows faster and gets too tall, so you may not want to use it. But if you have slopes, you need quick establishment for soil stabilization. Where it’s flat and you don’t have to worry about soil stabilization, you don’t need the wild rye. Asters, goldenrod and native grasses. 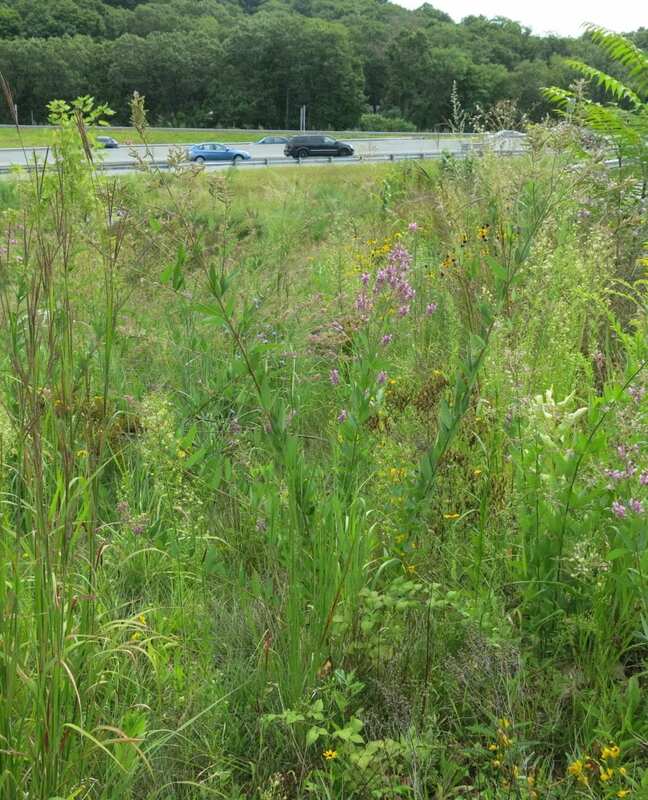 MassDOT, I-95 roadside native seeding, Amesbury, MA. You can use cool season species, such as oats for a season to deplete the soils. In fertile soil, you can get seed heads in the first season whereas it may take five years in infertile soils. Recommendations from Audience Member: Vinegar for weed control, avoid disturbing soil. Trays of seeded species will help with identification. Buckwheat can be used as a cover crop. Shape your contract to meet the need: three-year contract or, with invasive control, a five-year contract. Use sulfur to drop pH. Incorporate sand into the site to reduce fertility. Q: What are panelist’s thoughts on creating meadows by using plugs and on watering during drought? Seeding allows for more diversity and a more natural mix than plugs. Seeding can be supplemented with plugs to add emphasis, drifts, or other design elements to the composition. You need high density for weed suppression so creating a meadow with plugs can be very expensive. 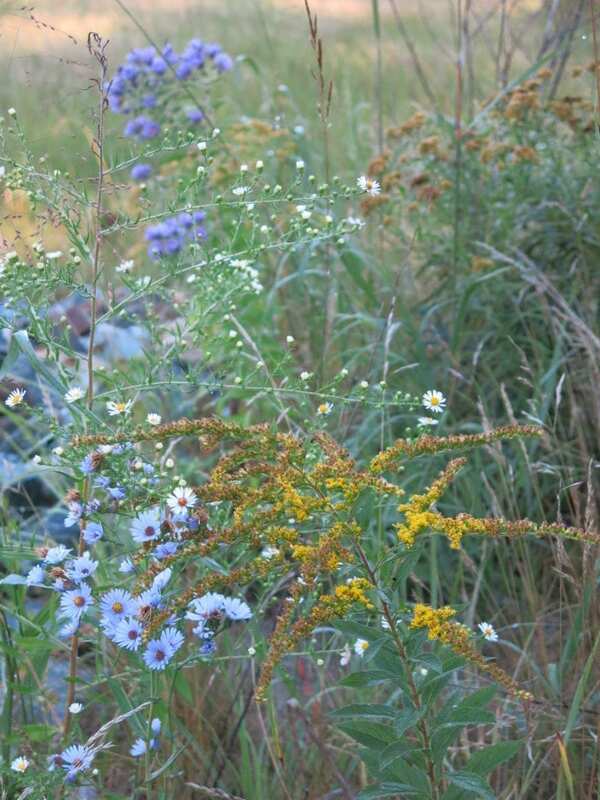 Fall Aster and native grasses. Mark Fiely, Ernst Conservation Seeds. Irrigation is not typically necessary for native seeding. Seeds will sit until they get the moisture needed to germinate. Dormant seeding minimizes the drought problem. Tara Mitchell is a landscape architect with Massachusetts Department of Transportation. 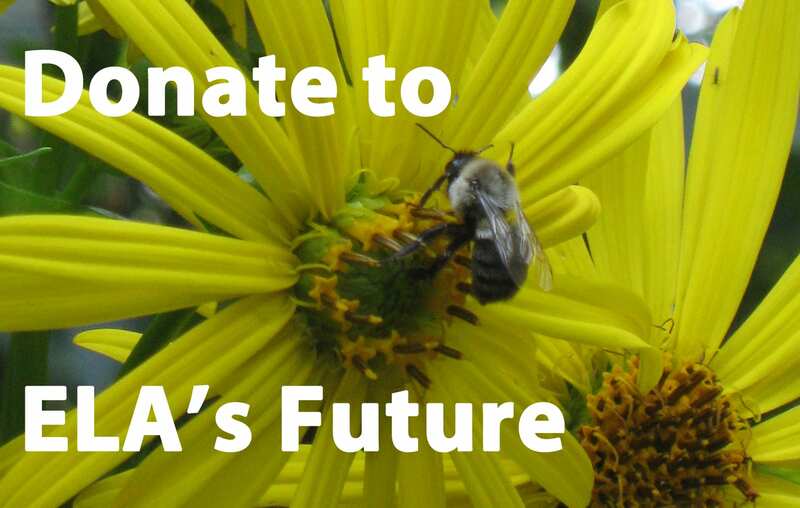 Her focus is on ecological restoration, naturalistic landscape design, native seeding, and vegetation management. Tara may be reached at tara.mitchell@state.ma.us.